After Round 1 went to India quite convincingly, Pakistan were expected to bounce back when Round 2 began in Dubai on Sunday (September 23). Rohit Sharma and Shikhar Dhawan, however, ensured there was one-way traffic yet again as they produced a masterclass of the highest order to help India stroll to victory by nine wickets. Some excellent death bowling by Jasprit Bumrah, earlier restricted Pakistan to 237 for 7 in their 50 overs. Rohit (114) and Dhawan (111*) then forged an immaculate 210-run opening partnership smashing individual centuries on the way, to give India a victory with as many as 63 balls to spare. With the win, India almost sealed a spot in the final of the 2018 Asia Cup and Rohit's beaming smile after the game was reflective of the mood in the Indian camp. "All of the guys showed great amount of character and it was important," said the India captain at the post-match presentation ceremony. "We spoke about it that whatever performances we have had in the past, we have to leave it behind, it is a fresh day and we need to give it all and that is exactly what the guys did. "It was challenging conditions, we knew it was going to be tough to come out and repeat the performance, but again I don't want to take any credit from all the 11 players who were out on the park today." The match was setup by the Indian bowlers once again. Electing to bat first, Pakistan were reduced to 58 for 3 in the 16th over before Sarfraz Ahmed (44) and Shoaib Malik (78) added a crucial 107 runs for the fourth wicket. However, Bumrah once again came back strongly at the death, bowling yorkers at will as Pakistan could only manage 26 runs off the final five overs. Rohit was effusive in praise of all his bowlers and had a few special words of appreciation for Bumrah. "Well, he (Bumrah) has matured as a bowler. He understands his bowling, and it is very important for any individual to understand his game, and he understands it very well," said Rohit. "He understands the fields he needs to set and on a wicket like this, you need to keep it clever, you need to keep it tight and that is exactly what happened. "Even Bhuvneshwar Kumar to start with, he kept the pressure on the Pakistani batsman and it was important to keep the pressure on at all times. We never wanted to let them off the hook, it was important to keep it a bit tight and again, our spinners have been magnificent throughout the tournament, they kept taking wickets in the middle and when you keep doing that, that's the amount of runs you are going to chase." 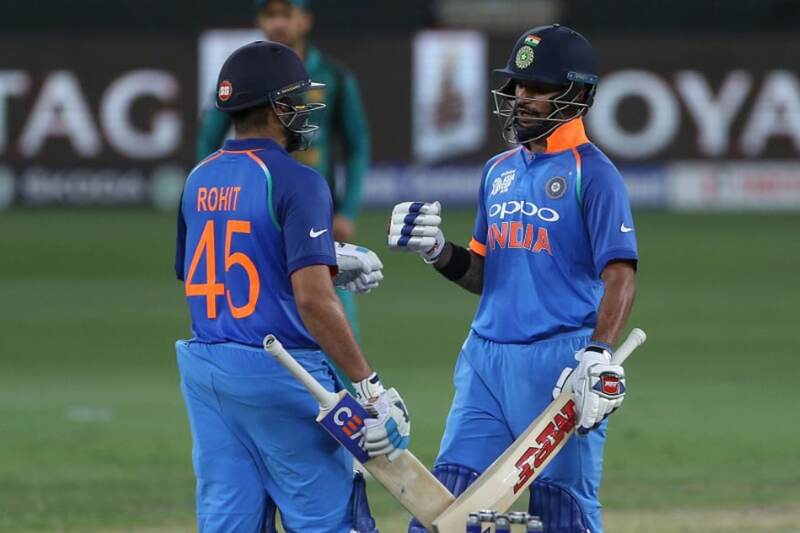 While a target of 237 could have been tough on a two-paced Dubai surface against the might of the Pakistan bowling attack, Rohit and Dhawan hardly broke a sweat in chasing the runs down. "With Shikhar I don't need to speak much. It is important to just let him be himself, and we have batted enough now to understand each other's games. We all know how important the first ten overs are and not losing wickets upfront puts us in the driving seat," said Rohit on his and Dhawan's record-breaking partnership. While Rohit smashed his 19th ODI century, also going past 7000 runs in the 50-over format to finish on an unbeaten 111, Dhawan looked in majestic touch during his 114. The left-hander was also named Man of the Match for his 15th ODI ton. "I enjoyed my game and I've been in good touch and just wanted to make the most of it," said Dhawan after the game. "It's a good batting track and I have enjoyed the way I was batting. It was sensible and liked the balance of it. Pakistan have got a good bowling attack and I knew that as openers we have to stay because they have got good pace and once I got set, I kept carrying on. "As I've mentioned I wanted to be sensible with my shots as I've thrown it away in the past. That's the good thing for me and it's nice to have that balance. When you play 20 overs it gets easy. The plan was not to lose wickets in the first 10 overs. Rohit played an amazing knock today and he's very good at converting those 50s into 100s and that's something I've learnt from him." Meanwhile, Yuzvendra Chahal, who picked up 2 for 46, attributed India's consistent show with the ball across formats to a skilful pool of bowlers and confidence shown by the team management. "Our bowling pool has swelled to 10-15 and earlier it wasn't so. Now one who is replacing you is also as skilful," Chahal told reporters. "Even in England, the way our bowlers have dominated, it shows the regular flow of spinners and medium pacers in the team. Also the confidence showed by the management, that is important for a youngster. There is no negativity, you can concentrate on your bowling." "Our batsmen put their bowlers under pressure from the start. They are playing the new ball well, they are taking their time and partnership are getting longer," he said. "In this wicket, you have to vary line and length. But they got mentally down as the match was slipping away, so the situation was different. "Sometimes it happens, teams don't have a good day but they (Pakistan) are also a good team. So it is not a one-sided thing, the tournament is still not over." Pakistan, on the other hand, were left to rue their chances. Rohit was dropped three times during his knock, by Shadab Khan, Imam-ul-Haq and then by Fakhar Zaman, which ultimately brought about their downfall. The Pakistani captain, Sarfraz admitted the lapses in the field eventually cost them the game. "The match was pretty tough, although we put up a decent total on the board, but if you don't hold on to your catches then even 280 would not have been defendable," he said. "The guys are really working very hard, but I am not so sure what is going wrong, the catches are getting dropped at crucial times, which is why the team is suffering. "In the last match as well, you saw the catches that were dropped eventually cost us the game. Today, as well, I thought the pitch was slightly tougher to bat, if a new batsman went it wouldn't have been easy to play his shots from the word go. So, in that case, if we would have taken our catches early I don't think we would have found ourselves in such a situation." Sarfraz also defended his decision to bat first insisting the surface was not an easy one to score right from the get-go. "If you look at the surface even today, the cracks were wide open and it was not easy for batting," he insisted. "If we would have taken early wickets, things would have been different. 270-280 would have been tough to chase on this track. "If you got to get past top teams, you have to get your skill level up. At the moment our skill level is slightly lower than theirs. If we want to reach the final and compete we will have to improve a great deal. Our next match against Bangladesh is a do-or-die game, we will try our best to win that and get into the finals."